Spring is in the air and I am LOVING it! As long as I take my allergy medicine every day, I am great! Spring means flowers bloom, the trees sprout new leaves, the sky is blue and beautiful, and it just symbolizes new beginnings. Don't you just LOVE this time of year? When thinking about new beginnings, you can't help but to think about ALL of the clutter in your home you have accumulated over the last couple months. You collect things all year, but it's something about October-January when you just end up with SO many new things that it leaves no choice but to deep clean and purge what's no longer necessary to keep! I don't know about you guys, but I actually really love cleaning, so spring cleaning is right up my alley! Don't get me wrong, I absolutely have to be in the mood to clean, but if I do some proper planning, spring cleaning can be fun because I just LOVE clean, smelling good spaces! 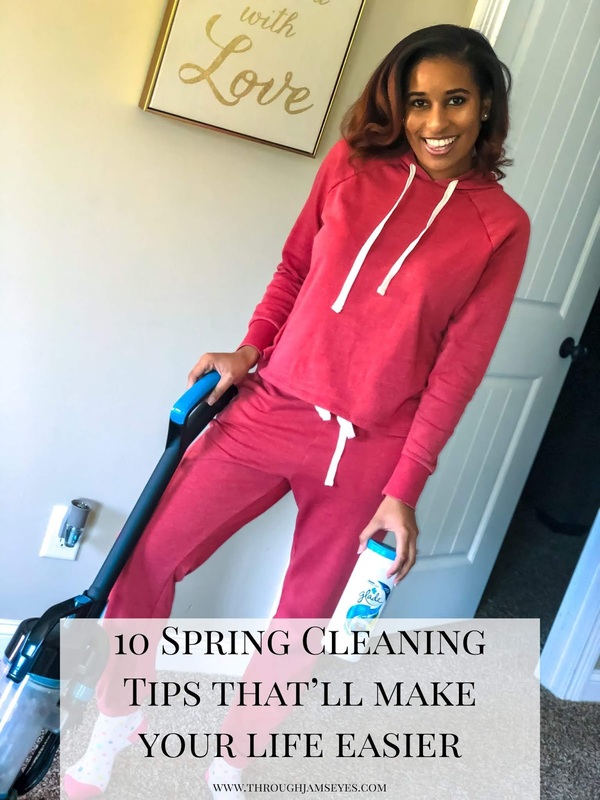 I am so excited to share 10 spring cleaning tips that I am sure will make your life much easier! For those of you who don't necessarily enjoy cleaning, but know it is a necessary evil, this will help you maximize your time and get it done quickly and efficiently. Once you have your schedule, then you need to figure out how you will tackle each individual room. Look deep in the corners that you may skip or behind the furniture and really figure out what you need to do. You don't want to leave any dust particles behind! Once you know exactly what needs to be done, then you will know everything you need and have it ahead of time. There's not many things worse than starting a cleaning project and then realizing you need something you don't have! Nothing helps me get through my cleaning days than a good playlist! I have curated some that I love on Spotify, but most of the time I will just go over to Pandora and listen to one of my favorite stations on there. Some days I need Gospel music to get me through, sometimes I may need trap music. Always have to have balance! So two of my favorite cleaning items are the Swifter Duster Super Extender Handle and the Spin Scrubber. I use the duster to reach my fan blades, in-between the stairs, floorboards and crown molding. I use the spin scrubber to clean my showers and tubs throughout the house! Both are lifesavers because they help me not have to reach and bend as much. Cleaning a shower is hard especially if you're trying not to get wet! The Spin Scrubber helps me to be able to stand outside the shower and barely use any energy at all. It's AMAZING! Whatever tools are your favorite, use them to make your cleaning quicker and easier. Cleaning disturbs dust before eliminating it, so a lot of times dust will be floating in the air and for people like me with bad allergies, it can really make you sick if you aren't careful. Wear gloves, masks, and clothes that cover your skin completely, and don't forget to shower right after you finish cleaning. Oh, and if you can open your windows or if you have a screen door, do that to let air go in and out to ventilate yourself from the cleaning product fumes. I don't know about y'all, but I get distracted SO easily! I can be cleaning one room and go into another to take something, get distracted and start cleaning in there! Don't be like me. If you start a bunch of projects, you'll more than likely end up tired with nothing complete and a bunch of projects started. This is when it is super important to stick to your schedule you prepared! This just makes the most sense. Start at the top of a wall or cabinet and get all that dust knocked down before you make your way to the floor and sweep. Sweeping, mopping, or vacuuming should be the last thing you do in a room. Trust me, if you don't do this, then you will end up doing double work in the end. This is something people tend to forget about. Most air filters in your home should be changed every six months. If you aren't sure when the last time you changed yours, do it while you're cleaning this spring and then make note of it so you will change it again in the next six months. Changing your filter helps you to breathe healthy air that isn't full of dust and debris. Take your time! Don't try to clean your entire house in one day. Also, be sure to use your time wisely. If you have deep stains, let them soak while you do something else. You'll be so happy when you have a cleaner, more functional home for the warmer months! These are such great tips! I need to schedule my big spring cleaning day!! I'm all about spring cleaning! we just did a bit of it this past weekend and it feels SO good to have everything clean and organized! I love all of these tips! I"m doing some cleaning on my day off soI'll definitely refer to these! These are such great tips! I definitelyyyyyyy need to do some serious spring cleaning! My favorite thing about Spring Cleaning is decluttering! I can't wait to go through everything and PURGE!! lol. Thanks for all the tips! I'm thankful that spring cleaning doesn't scare me. I clean my house so frequently that it doesn't really need any deep cleaning - but I am purging my closet! These are super awesome tips! A great playlist does wonders for this! Great advice, good music and supplies make cleaning so much easier! These are great tips! I love playing fun music while I'm cleaning, it makes the chore seem less boring! Great tips! I love spring cleaning! These are great tips girl! Now commences the spring cleaning. These are such great tips girl!! Love springtime too!! Awesome tips! I took away some great advice that I going to apply. Make a list of what to do in each room! Those are such great tips.. Thanks for sharing!! I just got that extended duster and LOVE it! Makes cleaning so fun! Cleaning alone is definitely almost a full time job. It can get messy and exhausting. So for me having a good playlist and amazing cleaning products are of the essence. Lysol and Windex are among my favorites. Such a great post! I started doing some spring cleaning myself! I hate cleaning but you got awesome tips. Thanks for sharing. Okay! I'm going to throw away those old Tupperware containers. LOL. I need to be better about decluttering. Love deep cleaning but I tend to hold onto unnecessary items. Great tips! Spring cleaning can be such a task and so tedious however we always feel good when it's done! Great tips - I love a good Spring cleaning!